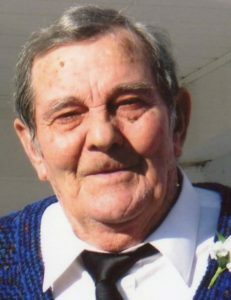 Coats, NC: Mr. Clyde Henton Turlington, age 85, of 580 McLamb Road passed away on Monday in his home surrounded by his many loved ones. Funeral Service will be 11:00 AM Thursday, August 30, 2018 at Rose & Graham Funeral Chapel in Coats. Elders Noel Lee, Tony Parker, David Brooks, and Chaplin Paul Conley will officiate. Burial will follow in Lakeside Memorial Gardens, Angier. Mr. Turlington was born February 23, 1933 in Harnett County to the late Herbert Henton and Blanche Gaskin Turlington. He was preceded in death by his infant son Bennie Henton Turlington; siblings: Edward Turlington, Kenneth Turlington, Mildred Hudson, and Evelyn Turlington. Mr. Turlington was a farmer and he was very passionate for his crops and garden. He also had a very special bond with children, they could always bring a smile to his face and brighten his mood when nobody else could. Survivors include wife of 63 years, Joyce Matthews Turlington; children and spouses, Johnny Turlington and wife, Brenda of Coats, Danny Turlington and wife, Vickey of Coats, Russell Turlington and wife, Anne of Buies Creek, and Steve Turlington and wife, Rose of Coats, grandchildren, Jonathan Turlington, Amy Pope, Robert Jackson, William Jackson, Amber House, Josh Waters and Taylor Waters; fourteen great-grandchildren; sister, Grace Freeman of Broadway; special sister-in-law, Jutta Turlington of Coats; and many loving nieces and nephews. Family will receive friends from 6:00 PM to 8:00 PM Wednesday, August 29, 2018 at Rose & Graham Funeral Home in Coats. Flowers are welcomed; however, memorials may be made to Gift Primitive Baptist Church, in care of Betty Manning, P.O. Box 490, Coats, NC 27521.